One of the key issues faced by Sri Lanka is the reduction in Foreign Direct Investment (FDI) from $ 1.5 billion in 2014 to $ 0.8 billion in 2016 whilst export attractiveness dropped from $ 11.1 billion in 2014 to $ 10.3 billion in 2016, which tells us that the attractiveness and competitiveness of the country has dropped. On the tourism front, from a growth of 26.7% registered in 2013, tourism arrivals are struggling at just 2.7% as at 2017 to date. This means Brand Sri Lanka has lost its power, which is reflected by its marginal growth from $ 73 billion to $ 78 billion in 2017. If we analyse best practices, we see that managing a country’s brand is strongly hinged on the political ideology of its leader. The reason why Brand USA is hovering at $ 19-21 trillion, with just 2-4% growth, is because of the slow pace of GDP growth and the perception created by President Donald Trump. At one time Brand USA was the most predictable brand in the world given the stable decision-making of its President. But today we see that President Trump has fired almost 12 key people from his inner circle within just a two-year period while his attitude to immigrants and climate change has irked the world. With such a perception created, specialists report a drag on the brand. An ally of President Trump, former National Security Advisor Michael Flynn pleaded guilty to giving false statements to the FBI, which does not augur well for Brand USA in the area of governance. 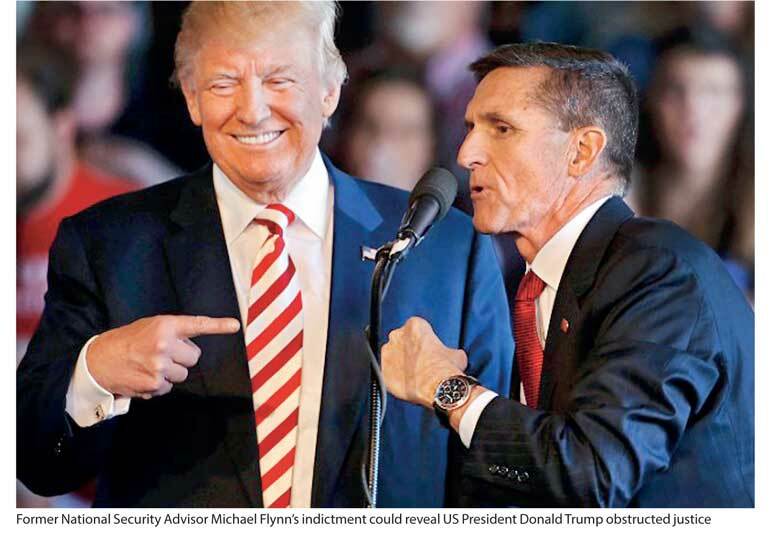 US prosecutors have accused Flynn of “wilfully and knowingly” making false statements to the FBI while serving in the Trump administration in the backdrop of Trump stating that Flynn had done nothing wrong, which means Trump can be charged with obstructing justice. Court documents indicate that Flynn was charged on a single count of making false statements after telling the Federal Bureau of Investigation (FBI) he had not discussed sanctions with the then-Russian ambassador to the United States. Apparently Flynn has agreed to cooperate with the investigation and has also indicated that Trump transition officials directed his contacts with the Russians, which means that the former top Trump aide is ready to implicate people in Trump’s close working team which will leave a huge dent in the country’s brand, according to specialists. In fact its rating in the Governance criteria as per Simon Anholt’s Nation Brand Building Model has declined from No. 19 to No. 23. This is a similar challenge to the one Sri Lanka will be up against when the Bond Commission Report is handed over to the President on 8 December. There is a saying that good advertising kills a bad product. This is what has happened to Brand USA. From a governance front as well as through political leadership, the economy and immigration, which are key pillars in the computation of the power of the brand, we see how Brand USA will be hit, hence its present perception. This is not positive and impacts the performance of all areas like FDI and exports which are the strong tangible drivers of a strong nation brand. This is something that Sri Lanka must also pick up as the current suggestions by the United Nations Human Rights Council (UNHRC) for Sri Lanka to follow guidelines in implementing war crimes hearings, the bond saga and poor policy in tourism will have a similar impact on Brand Sri Lanka. Just like soap and toothpaste are branded and this has helped increase sales, we see how people have used the same principles of branding to increase commercial value such as Shah Rukh Khan or Kumar Sangakkara. Similarly, in the recent past national categories like tourism have used the best practices of marketing to drive up brand value. The best case in point is Maldives Tourism driving the positioning of ‘The Sunny Side of Life’ which has helped attract $ 400 tourists to the country and drive revenue up through the 1.2 million visitors that arrive annually. A country which adopted the best principles of marketing in Nation Branding in 2017 was China. Its brand value catapulted from $ 7 trillion to $ 10.2 trillion, making the brand grow at 44%, which has made a significant contribution to tourism, FDIs and the overall economy. President Xi Jinping way back in 2012 had issued a policy statement that China was going to move away from being a component manufacturer to a brand marketer. Today, there are 50 top global Chinese brands in the 500 most valued brands worldwide, which tells us how when a Nation Brand grows its economy’s KPIs pick up. The parallel to Sri Lanka is that unless we take the components of brand building and improve them in a focused manner, be it tourism, governance, political leadership and export strategy, we cannot expect Brand Sri Lanka to cross the $ 100 billion mark from the current $ 78 billion in the next few years. Against this backdrop if we examine in-depth how Brand USA focuses on building their nation brand, we get a good case in point for Sri Lanka which is also pushing the same agenda. While nation branding is being challenged, we see that the US is the only country which has successfully driven a private sector model of tourism promotion. 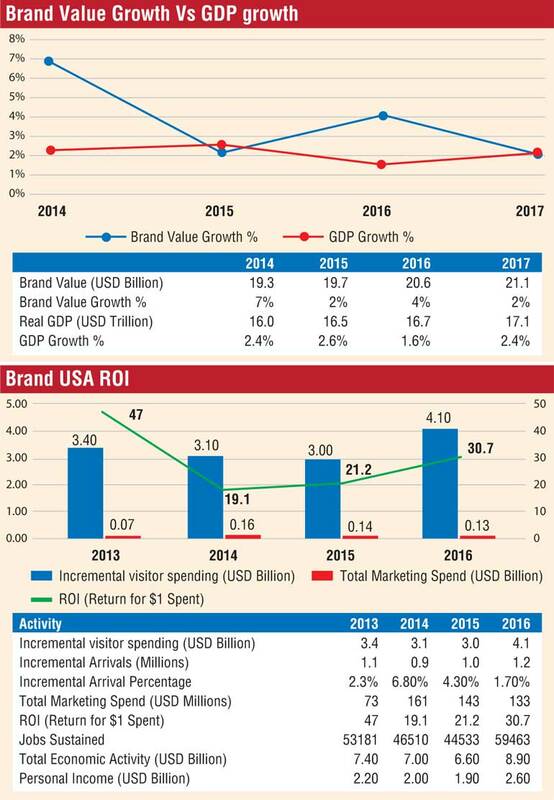 With the working model of Brand USA Inc’s overall investment with marketing, the return on investment is between 19% and 30.7% from 2014- 2016 as per the chart below. Overall tourist arrivals have crossed 65 million visitors in 2016 and the marketing program by Brand USA generated incremental traffic of 1.2 million at a ROI of 30.7% in 2016. Sri Lanka must also look at this model of marketing the tourism sector given that as we speak almost Rs. 4 billion has been left idle for over four years with the industry numbers dropping to a crazy 2.7% and many key properties in the market for sale given the crunch on the bottom line. Maybe it is time Sri Lanka remodelled the Sri Lanka Tourism promotional arm so that we can learn from the number one brand in the world - the USA. Hence we see how the perception of a top global brand can have an impact on the overall attractiveness of a country if the management of the country is not scientifically conducted. Given that over 70% of the economy comprises the private sector, rather than pointing fingers we will have to show leadership and drive the technocrats to bring best practices to Sri Lanka too. The issue is that the whole of Sri Lanka will be in election mode for the next two months.